Please use our sony camera battery finder to check which battery you need. Please do not mistake FC11 and FS11. They are for different cameras. FC11 is a smaller size battery. FC is also referred to as info-"C" and FS as info-"S". 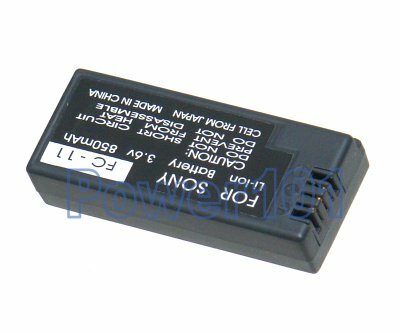 These batteries are compatible with all of the following cameras: Sony CyberShot DSC-P10, DSC-P2, DSC-P3, DSC-P5, DSC-P7, DSC-P8, DSC-P9, DSC-V1. If you have a different camera, please check our camera battery finder. These batteries can be charged by any standard chargers compatible with FC10 or FC11 batteries. Such as the charger that came with your camera. - only $3.31 just 1 left!